The Israel Museum in Jerusalem, Israel’s national museum, is the country’s most prestigious cultural institution. Head curator Alex Ward extended an invitation to karlssonwilker to spend 12 eventful days in the nation’s capital. Following 12 days in Serbia and 10 days in South Africa, this was the third of our immersive trips overseas. And again, the destination was another country with a highly complex history. 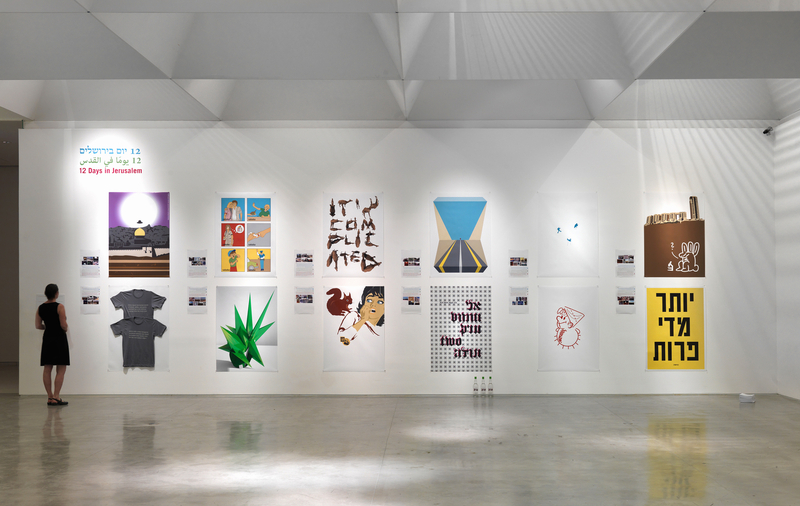 Invited to create a real-time design project for Israel Museum’s department of architecture and design, the goal was an exhibition wall filled with 12 large format pieces, along with excerpts and snapshots of each respective day. The project featured commentary about our daily experiences. Often, the perception of the designer can be unrealistic, as the designer sits safely at their desk, meticulously crafting every detail of communication to seemingly absolute perfection. As stated in previous projects, our real-time projects are about seeking experiences that challenge us to create work that is fast, raw, imperfect, and sometimes questionable. A: I had no expectations for final outcome of the project. For me it is a very personal project in “real time” so it is very different from inviting a graphic designer to design a commercial project. It is a gamble for both of us; most importantly, we must trust each other. Surely, in order to try and do something different from the norm one has to dive into the deep end. J: I want to thank you for going ahead with this project. For me the simple existence of a project like the one we did together is just as important as the actual pieces that comprise it—to highlight a different area of practice for us graphic designers. Any thoughts? A: I agree with you that projects like this one give the designer a rare opportunity to practice outside their normal commercial projects. Hopefully, it will also encourage the young generation of graphic designers here to initiate their own projects. Whether it was the commentary on the religions in the area juxtaposed with the frequent UFO sightings, to irreverent images defining “sababa,” the exhibition was a collection of everyday observations, thoughts, and experiences we had during our visit. The video below offers a glance into the scope of the trip, the daily interactions, and the complexity of the cultures involved. Whether it was the commentary on the religions in the area juxtaposed with the frequent UFO sightings, to irreverent images defining “sababa,” the exhibition was a collection of everyday observations and experiences that we had during our stay. The video below offers a glance into the scope of the trip, the daily interactions, and the complexity of the cultures involved.